The Whistler CR90 has taken the best features of their top of the line Pro-78SE and added additional functionality including the ability to detect and alert to the LTI Truspeed S, Laser Ally & Laster Atlanta Stealth Mode laser guns. Along with increased KA performance and a fresh new look for 2013 the CR90 is whistlers first released GPS enabled radar detector so it can also give advanced warning for fixed speed cameras as well as red light cameras. 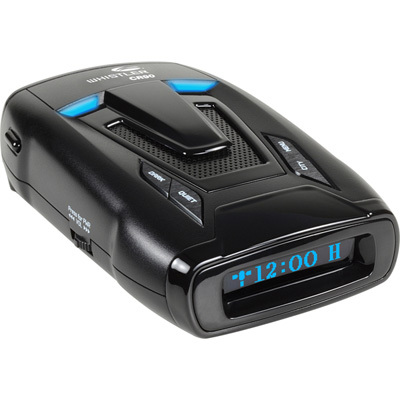 The Whistler CR90 is the best performing all around radar detector ever made by Whistler. The CR-90 Laser-Radar Detector will pick up all radar bands (X, K, KA) as well as all laser radars and has POP mode detection. The Whistler CR-90 Laser-Radar Detector has a quiet mode, city/highway function, and dual alerts to warn you if multiple threats are received. The CR-90 also includes an auto dimming display for a easier to read screen in both the day and night. Over the years I was keen on trying a radar detector, but was on the fence for a number of reasons. Many RD's were available at a cheap price, but I had heard of the horror stories of when they beeped too late. But when I saw the CR90 at this price with its reviews I had to get it and I am glad that I did. The device does provide adequate protection against the Ka band, but becomes quite noisy with the K and X bands. It does give out quite a bit of false alarms, but it generally keeps me in check with the surroundings. It lacks the directional alert, where one does not know where the signal is coming from, so it can be quite a pain to figure out if the alarm is valid or not. Overall for the price I paid, I am quite happy with what I have. I like it so far. Wasnt hard to update and I haven't had any problems. I really like the traffic camera alert system. Definitely has saved me a couple of times haha. Overall the functionality of the device is really good and its easy to use.